There are few men in the popular media in recent years that have been as easy to hate as Fred Phelps. His tactics and behavior, if not his convictions alone, have been sufficient to offend both right and left and everyone in between. His name has become synonymous with hatred. The news of his impending death seem to come as good new on the social media and curated media outlets I follow. And without any hint of surprise there are threats, commentary and speculation of returning, in kind, the protests and disdain Fred Phelps inflicted on so many other families. We have met the enemy and he is…. In many ways Mr. Phelps and the Westboro Baptist Church are children of this age and products of our own social imagination in which we believe the certainty of our own convictions is what gives us the identities we long for. It is what justifies us in our own convictions and keeps us from believing we may be wrong, that we may need to change, or even that we can. Let me be clear, I do not believe he made a valiant effort to seek the True, the Beautiful, and the Good. He was not in search of the life of classic virtues or even the Holy Life of the Christian Scriptures, but I do think he exercised a lot of what drives many of our own moral frameworks… “Be on the right side. Stick to your guns. Stand your ground. See it through to the end. Live by your convictions.” Aren’t these at least in part the vocabulary of what it means to be an American hero? This kind of reasoning works for us in the culture wars because it helps us to solidify identities in a time in which our culture identities are more shaped by what we buy and who we vote for then our last names, customs, language or loves. FaceBook feeds and the comment-section of nearly any article published online demonstrate that we are, in fact, happy to practice a kind of moral terrorism. The pure extent to which I can blast you is the extent to which I am right. To varying degrees, we all benefit from a system that helps us establish our identities by whom we hate, rather than by how we love. As long as we can demonstrate that someone or some group of people (Muslims, gays, Atheists, Christians, republicans, Congress, or Nickleback fans) are pure evil, we can be pretty sure that we are, relatively speaking, good enough. “At least,” says the Pharisee, “I am not like that publican!” (Luke 18:9-14) As long as someone else is playing the villain, then I most certainly must be playing something else. This quest for moral certainty (even if we are certain about moral relativism vs other people’s beliefs) keeps us, even forces us, to not examine ourselves. For example, If we so much as begin to admit that we are even a little bit racist, or wrong about our politics, or mistaken in life choices we have made… then we concede that we are like the bad guys we have so arduously denounced. To some extent, at least, these are all symptoms of chaos, not just disagreement. We have yet to learn that the intensity of my convictions alone do not make them evident to everyone else. Wether I believe that gays and lesbians will burn in hell, or that Fred Phelps will, the intensity or sincerity of that belief alone does not make it right let alone obvious to anyone except myself. Whatever form of certainly I choose to embrace, merely in opposition to someone else’s misled convictions, is surely as equidistant from the True, the Beautiful and the Good, as I perceive my enemies’ convictions to be. I am not saying we are just like Phelps. But I am saying that if we think he is so fundamentally different from us that we are not capable of being like him in any way, then we are most at risk of become more like him. 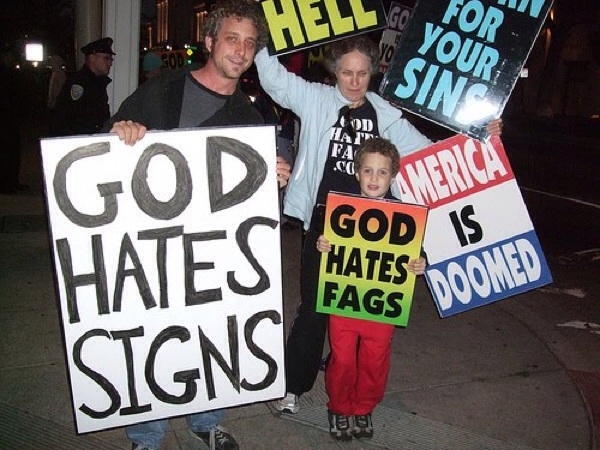 I first discovered the Westboro Baptist Church in the late 90’s when I had flown to Philadelphia to visit an Indian pastor friend of mine who had flown in from Calcutta for just a weekend. We were downtown, incidentally sightseeing as an excuse to be together when we were caught in an unexpected foot-traffic jam. A small group of protesters stood inside a roped off area in front of the city’s convention center brandishing distasteful signs and near pornographic images. Outside the rope, a flamboyant cast of sequined devils and drag queens were returning insults and mimicking the distasteful images from the church’s signs. In the building behind them, the General Convention of the Episcopal church was taking place, discerning their way forward in through a future that would become far more difficult before it would begin to get any easier. “It is a mean word for a lesbian.”I said. His face did not change. No fog of unknowing had lifted. He simply waited as if I had something more to add to my translation that would make sense of the one word I use to explain another. When he finally realized that I simply absolutely must be from Mars, he shrugged and returned to unpacking his bushels of corn, a thing which he knew to be from the Earth. At each shoulder I had a foreigner, an stranger to whatever kind of human ritual was being performed. I wanted, at the time, to translate or try to make sense of the occasion (because that is the kind of thing I like to think of myself as being able to do). But in retrospect, I find very little good in that effort. Here was an Amish man whose faith and culture had successfully protected him from frozen dinners and microwaves. Was this really the right occasion to explain to him with any nuance what a, “dyke” is? Another time, another place. I don’t need to draw him into this madness anymore than I need for you to come over to my family’s house this Christmas and try to make sense of Aunt Carol’s cheatin’ ways and Uncle Robert’s alcoholism. That is not the right occasion to meet my family. Here we stand at the occasion of the death of a broken, and often cruel man. The last thing I think we need to do is try to make sense of it. Fred Phelps made no sense. But that does’t keeps us from wanting closure, specifically, revenge. Our hunger for revenge is a kind of hunger for resolution. It is like looking for a good answer to questions that should never ever have been asked. There is a lot we need to tell our children about God, gays, marriage, protests, hatred, war, death and the future. Now is not necessarily the time to do that. The Westboro Baptist Church has tried to control the story by setting the stage. What we really need to do is change the venue. I want our kids to ask questions about different things than the distasteful signs. We need something else to catch our attention. 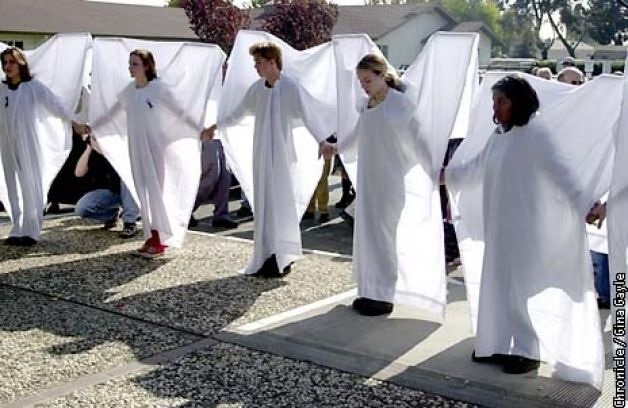 When I think of Westboro’s protests the thing that always comes to mind first is the invention of the Wall of Angels we first heard about at Matthew Shepherd’s funeral. A Wall of Angels is not merely a clever way of blocking out the hate. The presence of this heavenly host is itself a message that says there are people, strangers, willing put put themselves in the way for the sake of others. In this time and this place the angels will out-sing the shouting, the light will outshine the darkness, the love will out-live the hate. That is the kind of thing I want our kids asking questions about. “That guy who died… he was an awfully broken man,” we will say, “ but those people, they were heroes. 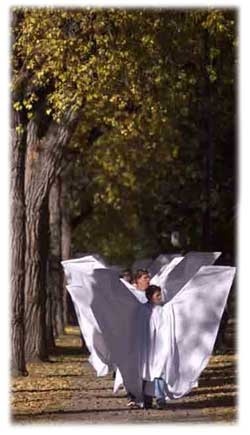 They were angels” The presence of others outside the funeral services, changed the story. At the very least they set a different stage. What would it mean if we were to protest his funeral? What would that even say? “A mean man had enemies?” That story is not worth my time. What good is our hatred? Fred Phelps cannot hear us anymore… But his family can, and that church can, and we can hear each other… and one day we can tell our children. What is what we can do is change the story. We can always find a way to love. We can not decide what Fred Phelp’s death means but we can decide what we will make of this moment in history. What we can do in this season of Lent is search out own lives and look to make peace with our enemies. How do we want this day to be remembered? So here is what I am calling for… One more Wall of Angels, a wall to stand between any more hatred and any of its targets. In this case it will also be a wall of grace to the others who are caught in the crossfire of trying to grieve a father, an enemy, a nuisance, a friend. I believe that hearts, when loved, can and do change. I believe that no death is ever redemptive. …but I believe that grace and forgiveness does. Just one more wall of angels. This time not so much as to keep evil out, but to finally let it go. Oh Doug, you have cause me much prayer time today. This is really beautiful. That which we have come to hate, has become us. We cannot hate because then we shall become that which we hate. Thank you for this. Wow. Truth. Incredible post, Doug. Beautiful, Doug, and so perceptive. Only forgiveness will heal, not hate or revenge. Barbara is right. When we hate we do to some extent become what we hate. If only we could live into the Prayer of St. Francis. To love is to be happy with, to accept, to forgive. You are my hero in this way Doug. In the face of egoic need to be right, the most effective response is to withdraw energy from the system. When in doubt, add more love. Thank you for all that you do in this regard.